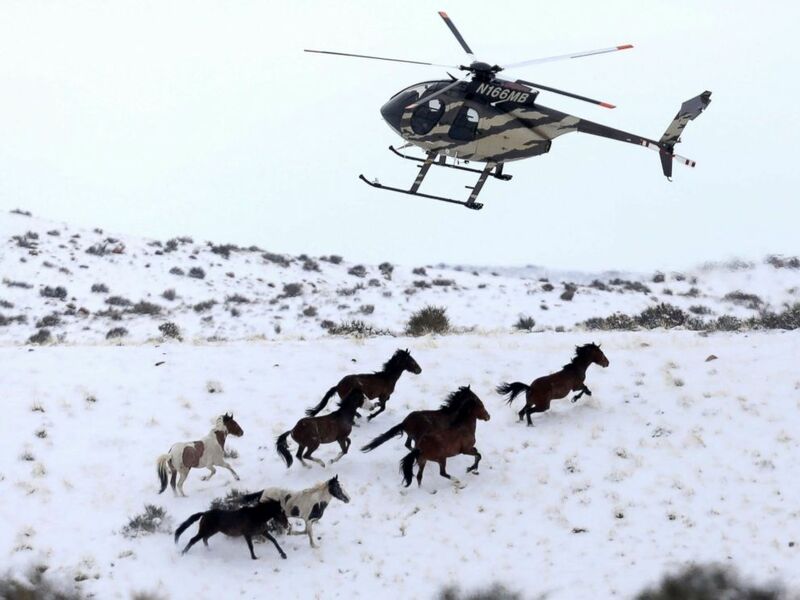 Controversy has broken out over the U.S. Bureau of Land Management's (BLM) practice of using helicopters to herd horses off public lands and sometimes permanently put them into holding facilities in an effort to control their population. 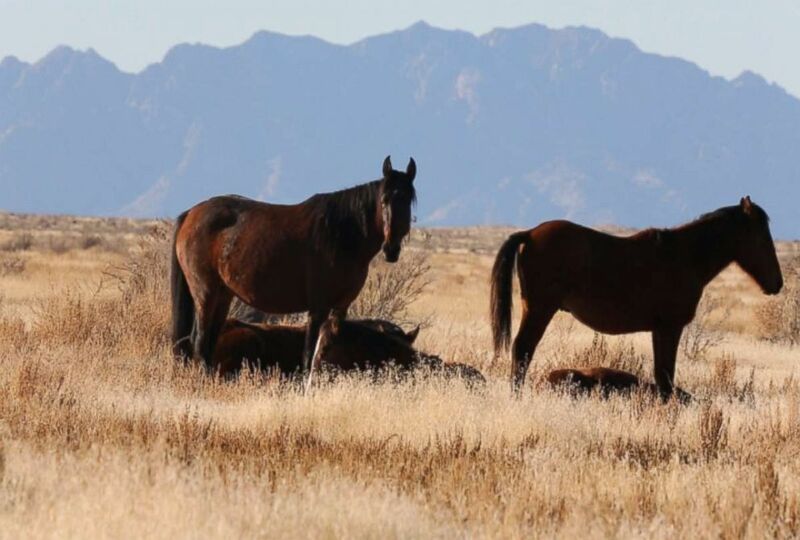 "Sometimes these horses get stampeded for miles and miles," said Simone Netherlands, an animal rights activist and a spokesperson for the American Wild Horse Campaign. Wild horses are herded into corrals by a helicopter during a Bureau of Land Management round-up outside Milford, Utah, Jan. 7, 2017. Now the government is considering culling these animals for the first time in nearly 50 years, putting the lives of thousands of wild horses at stake. Most of the U.S.'s estimated 75,000 wild horses live on public lands, usually vast expanses that the government controls in the American West. 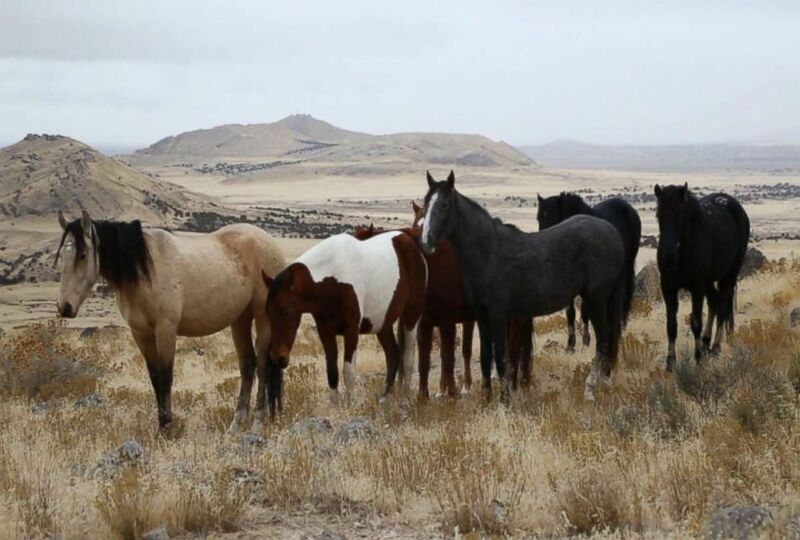 Jim Schnepel, who knows Utah's Onaqui Range and its horses well, works with a non-profit desperately trying to find a humane and effective way to control the wild horse population. "Anybody who loves horses can tell you there's this natural connection you can develop with them," Schnepel said. "Certainly with specific members, you know, there's no doubt that a few of them recognize me and I reckon I definitely recognize them." Wild horses are seen here in the American West. Although the land seems limitless, the BLM says the resources here only allow for the survival of a certain number. "They've set what they call 'appropriate management level,' AML," Schnepel said. "It would be about 75 percent reduction for what we have right now." Horses aren't the only animals on the range. Sheep, cows and other livestock also share the land. The BLM controls one-eighth of the country's landmass, but leases over 60 percent of it to ranchers. Since their livestock rely on the same resources the wild horses do, some ranchers want the wild horses pushed off the land entirely. After the wild horses are rounded up, Schnepel said some will go in the "adoption circuit" where they are domesticated as pets or work horses. "[But] typically," Schnepel said. "They’ll get put into a long-term holding and that means they get shipped to the Midwest. BLM has contracts with ranchers back there that pays them so much per day to keep the horses." There are over 45,000 wild horses currently in holding areas, costing taxpayers about $50 million annually. It's an expense that the U.S. Department of Interior sought to address in its 2018 budget by lifting regulations that prevent slaughtering wild horses. If slaughtering wild horses becomes legal, some animal rights activists are concerned that these horses will become extinct. "The BLM, the very agency in charge of protecting them, is asking Congress for permission to kill them," Netherlands said. "They've stockpiled wild horses in holding pens ... and so now what are they going to do with all the horses that they've stockpiled? The adoption rates are not high enough so they can't adopt them all out. So now we have a bunch of wild horses that the taxpayers are paying for and holding facilities and their solution is kill them." But BLM maintains the activists and the federal agency both want what's best for the animals and denies that any of their practices are cruel. "There's three things that wild horses need: food, water and obviously space," said Lisa Reid, a BLM spokesperson. "As you can see we do have millions of acres out here, but not every acre is producing viable forage for the horses. So you know just as with any type of species they have to be managed just so that they don't become ... overpopulated and diseased." Reid said the agency's goal is to always have healthy horses on healthy rangelands, which is aided by controlling their population. They no longer have many natural predators in the wild. "By our count we are overpopulated by sometimes 300 percent on most of our herd management areas," she said. "The Bureau of Land Management is a public agency. We have to answer to all groups. ... So we have to try and find that balance to make sure that we can do what's best for the horses." But the key battle for the horses won't be fought in the West. Their fate will be decided in Washington, D.C., where Congress will decide if the Department of the Interior's budget allowing for slaughter will be enacted. 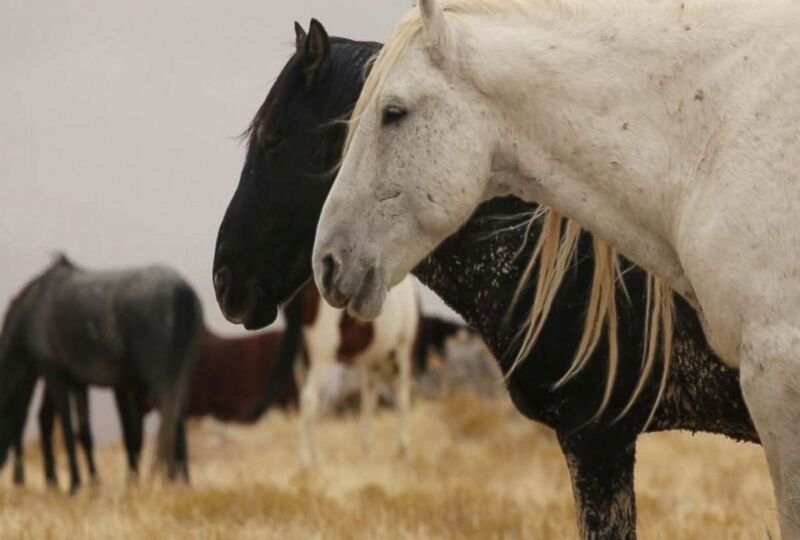 "Eighty-four percent of Donald Trump's voters oppose the slaughter of wild horses, and a very narrow band of people are for it because they profit from it," said Chris Minakowski, a lobbyist and policy analyst. Those opposed to wild horses continuing to be free say it costs as much as $1 billion dollars over 10 years, but Minakowski said that number didn't seem reasonable to him. "It's not reasonable because they are calculating incorrectly," he said. "They're estimating that you have to remove all these horses and put them into a holding and pay for them, which is simply not the case." Advocates say the government also hasn't invested enough in targeting alternate solutions to population control. Schnepel has tried darting mares with birth control in hopes that it will mean fewer foals. He said the contraceptive and darts they use cost about $30 per horse, which costs much less than to keep them corralled. The horses need a new contraceptive shot every year. "It gives them about a 96 percent resiliency to getting pregnant," he said. For those horses that are rounded up, a lucky few make it to places like Ellie Price's Montgomery Creek Ranch in California. She is dedicated to turning the wild horses into companion animals and cares for over 200 of them. "These horses are gentled now so I don’t even think of them as wild mustangs anymore," Price said. "But this horse was born in the wild." Trainers work painstakingly to acclimate these horses to a human's touch. "Well what I hope people will take away from seeing our horses at Montgomery Creek Ranch is that they have value," Price said. "They have this capacity to be good riding horses, but the big pictures is that ... wild horses need to stay in the wild on public lands." As for Netherlands, she believes these horses are "our American spirit." "[They are] the living remnants of a long past," she continued. "It makes me feel like, wow, you know, these horses were here before our ancestors ever got here, so how lucky are we that we can still come out here."